Our friend Daniel Start rang us up while we were in Devon last year (2007) enjoying the last of the summer. Did we want to go swimming in the Dart with him as part of a new book he was writing? Of course we did! I spent a good deal of my childhood wild swimming in the Dart so I was very keen, we both love being in water, and it was looking to be a very hot day. Daniel pointed on the map to a stretch of the Dart up on Dartmoor and when we arrived, a walk through the woods was our introduction to the wild swimming in store. For much of the walk we could hear the river far below and caught glimpses of the rapids through the trees. This particular excursion did not make it into the book as it was considered too dangerous (probably a wise decision) but I hadn't had so much fun in ages! We spent around 2 or 3 hours (we had wetsuits on) wild swimming down the rapids, jumping into deep pools, plunging over waterfalls, and coasting quietly along the gentler sections and then we were back where we had started. A nice pint of ale warmed us up nicely in a local pub. 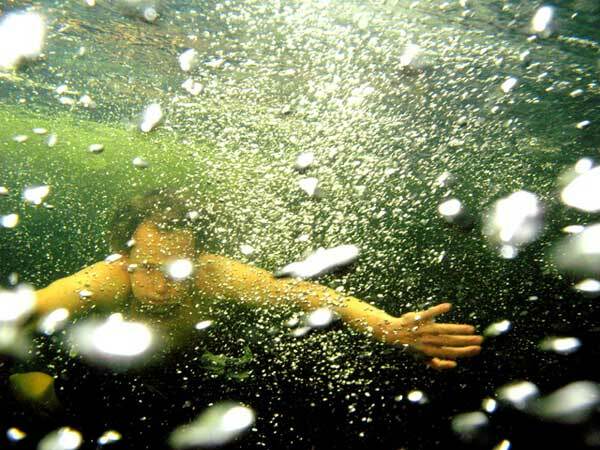 Months later and Daniel had finished his exhaustive exploration of the UK's finest freshwater wild swimming sites and his book, Wild Swimming, is published and on the shelves, a good companion to have along on summer excursions and holidays. Wild swimming lives up to it's name: a comprehensive guide to 150 wild swimming sites of mainland UK. 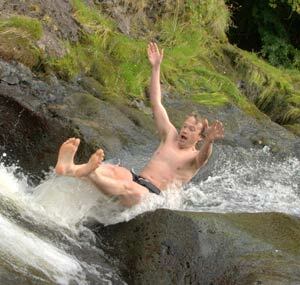 The wild swimming sites are all freshwater including lakes, rivers, swimming holes and canals. 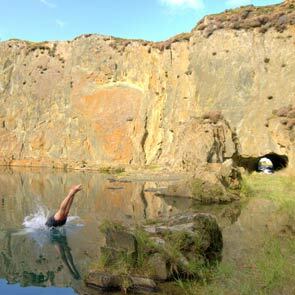 There is something here for everyone - family friendly wild swimming sites, easily accessible places to take a dip in our great outdoors, and truly wild swimming in remote locations for the more adventurous. But more than that Wild Swimming is Daniel's quest to recapture and re-enter a world of childhood memories, endless summer days, a looser concept of time, days spent messing about in water, contemplating ripples and sunbeams, with no more troublesome thought to distract than how best to have fun. A return to wild and quite places where one has time to think, uninterrupted by those busy thoughts of everyday life that so impinge on every moment. Wild Swimming invites you along to both these places: to explore the rich variety of wild swimming sites in the UK, and to shed the sensory and mental shackles of everyday life (at least for a while). Wild swimming is one of those great British pastimes perhaps more popular in the past when we seemed to have a more sensible grasp of risk assessment and were less paranoid about dirt. That's not to say that wild swimming is dangerous or dirty, but many is the time I have tried to persuade people to come for a wild swim to have them retort "it's dangerous" or "it's dirty in there". They would be left on the bank hot, sweating, bored, and probably a bit smelly. Wild Swimming is a book for those of us still in possession of beating hearts and with a healthy appetite for life. Wild swimming the book is navigable both by region and by swimming category. So if you are on holiday in, say, the south west you can easily look up the local wild swimming sites. However wild swimming also lists the sites by category - for example you might be after a wild swimming site for the perfect picnic (that other great British pastime), perhaps there has to be a pub near the river, or maybe you would like somewhere great for jumping in. The photography is great with some really evocative pictures that will get you just dying to jump in and go for a swim. Some of the pictures show amazing and remote countryside, some are more artistic and abstract, conjuring up childhood memories of those long summer days. 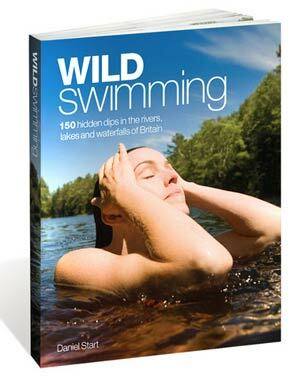 The book also includes interesting asides and ideas for activities and fun to be had around wild swimming. There are sections on animal life you are likely to encounter and of course a section on safety and the legal side of things. There are grid references, maps, and directions as to how to get to each unique wild swimming spot: Wild Swimming is not just a book designed to impress visitors to your coffee table - it is a practical guide book for those people that actually want to go wild swimming. Wild Swimming is still great for leafing through at your leisure, getting ideas for places to go, things to do, or just having a look at the great pictures. Keep it on your coffee table if you want, but the main point is to use it: plan a fun watery excursion, a Winnie the Pooh style expotition (don't forget pro-things! ), and take it with you whenever you venture out and about (it is a very practical size and weight). Where can you buy Wild Swimming? Wild Swimming is available in the shops, but you can save 15% off RRP when you buy Wild Swimming direct from the publisher here. The Wild Swimming website, www.wildswimming.co.uk, also has a mailing list which will keep you updated on new wild swimming sites as well as an excellent Google map showing wild swim sites.